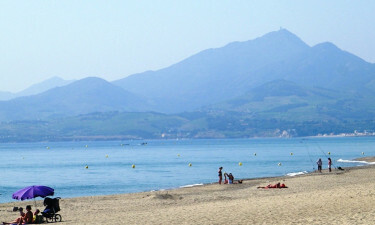 The holiday camping site of Le Soleil is set in a landscape of unique and majestic beauty. It is where the might of two awesome natural forces, the imposing Pyrenees and the magnificent waters of the Mediterranean meet to create a stunning spectacle. A luxury camping site can ask for no better backdrop with which to tempt visitors. By situating itself right on the golden beach, Le Soleil offers a level of camping luxury that is difficult to beat, but it does not stop there. 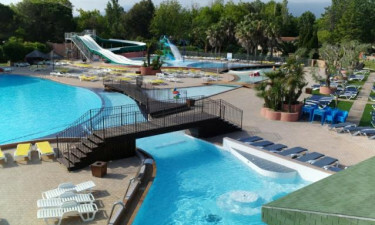 Secure a mobile home here via LUX-camp and also enjoy the very impressive swimming complex with its enormous heated pool that has the type of slides and other features that guarantee a good time for the entire family. By also being wheelchair accessible, this luxury camping site truly caters for all. Natural and man-made water enjoyment. A vast range of activities both in and out of the water. A mobile home that offers luxurious refuge when needed. Renting a mobile home at Le Soleil via LUX-camp allows you the luxury of camping on a beautiful beach, but comfortably ensconced in a spacious and well-equipped mobile home. Select a mobile home with a deck to cater further to the pioneering spirit that camping elicits, even if Le Soleil does fall under the luxury camping banner. Camping luxury moves from the mobile home to the pool deck where sun loungers and parasols await those who simply want to bask in the sun and savour the feeling of being catered to and pampered. Then there are the cooling waters of the 1,500 m2 swimming pool waiting to wash away any sun-induced slumber. If the pool with its very entertaining slides, or the Jacuzzi and whirlpool do not provide enough holiday activity, then the dazzlingly blue Mediterranean and a bordering river contribute plenty to the cause. Scuba diving and fishing are just two of the popular things to do on this camping holiday. The campsite also has a children’s playground and a sport field. The East Pyrenees region of France is famed for the vineyards and orchards that add to the splendour of its scenery. A day trip of discovery will enthral everyone with the riches to be found. Roman chapels, citadels, and modern art museums can all be explored during this amazing camping holiday. A snack bar at the pool conveniently alleviates the hunger pangs throughout the day, while a restaurant serves delicious meals both on-the-spot, or as takeaways. There is also a beach bar to take care of the beach-lovers. 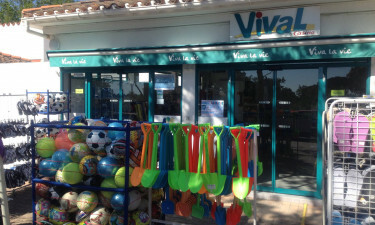 Those wishing to cater for themselves at Le Soleil will find everything they need at the campsite’s mini market. From early morning, the irresistible aroma of freshly baked bread and pastries also fills the air with tantalising promise.